I now have in my possession a pocket-sized computer which, when I speak a question to it (“Who is the author of Kraken?” “Who was the fourteenth president of the Unites States?” “What is the name of John Scalzi’s cat?”) provides me an answer in just a few seconds. If I take a picture of something, the same pocket computer will analyze the photo and tell me what I’m looking at. Oh, and it makes phone calls, too. Among other things. None of that is the cool part. The cool part is, when I speak a question to my pocket computer and it gives me a bad answer, I get annoyed. Because here in the future, when I talk to my pocket computer, I expect it to get the answer right the first time. I think I’ve said before that one of the neat things about getting older is that you really do become aware just how much things change. To be more specific about it, as you get older, at some point you cross an arbitrary line and are aware that you are now living in the future. I’m not precisely sure when it was I crossed my own arbitrary Future Line, but I’ll tell you what, I’m well past it now. Original title and link for this post: Life is unfair! About 200,000 academic journals are published in English. The average number of readers per article is 5. I don’t know where those numbers came from, but five readers per article sounds about right. When I was a grad student, I felt like a fraud for writing papers that I wouldn’t want to read. Only later did I realize this is the norm.You’re forced to publish frequently. You can’t wait until you think you have something worthwhile to say. If the average academic article has five readers, most would have fewer. Since some articles have hundreds of readers, there would have to be even more with practically no readers to balance out the average. Readership may follow something like a power law distribution. It could be that the vast majority of articles have one or two readers even though some papers have thousands of readers. I want to show you a method that will allow you to see your goal conversion funnels in any report, segmented however you want. I’m going to name it the “Horizontal Funnel” since we’ll be viewing it left to right, instead of top to bottom. Let’s start with what you’ll get, using this method. Number of visits to each step in the funnel. In the image below, the values outlined in blue are the visits to each step, and the values outlined in orange are the exit rate between steps. It’s like a regular funnel, just flipped on it’s side, using goals, first steps in funnels, and custom reports – more detail below. As you can see, this is in a keyword report. So, the funnel can be seen in-line in the report, for whatever segments you want; in this case for individual keyword phrases. And you can apply Advanced Segments or Secondary Dimensions to the report. That’s the “what”. Now for the “how”. For each step in the funnel, we create a separate goal in GA. This provides the values in blue: how many visits touched each step. Now we want to be able to get the values in orange, the exit rate between steps. In each of the goals following the first step in the conversion process, we create a funnel. Each funnel contains a single step which is the Goal URL for the preceding goal. That’s the key. The preceding goal becomes the Funnel Step 1 URL for the next goal. Now that the goals are set up we can create the custom report we need to view the data. To set up the report we are going to use two different metrics, Goal Completions and Abandonment Rate. The Goal Completion metric is the number of visits in which a particular Goal URL was visited at least once. The Abandonment Rate metric is the percentage of visits that started the funnel (saw Step 1), but did not complete the goal. In our Goal #17, we made the Funnel Step 1 = Goal #16 Completion. So, Goal #17 Abandonment Rate = percentage of visits that saw Goal#16 but did not complete Goal #17 = Exit Rate between the 2 goals. In this example the first step in the funnel is in Goal Slot #16, so Goal 16 Completions goes first. The second step was in Goal Slot #17, so we place Goal 17 Abandonment Ratenext, followed by Goal 17 Completions. Then Goal 18 Abandonment Rate, followed by Goal 18 Completions. After you have all the goals in place in the Metrics section of the report, it’s time to move on to the Dimensions. In this case, we chose to dimension by Keyword. But you may wish to see your goal funnel report by City, State, Browser, Landing Page, or whatever is most appropriate for your situation. That’s it. Happy Funnel Segmentation. As Ophir Prusak helpfully pointed out in the comments section, it would be a good idea to note that the values you get using this method may be a little different from what the Funnel Visualization report shows. One of the reasons for this is that the Funnel Visualization report makes the assumption that If a visit includes Step 3, for example, then it MUST include Step 2 and Step 1. So if an actual visit sees Step 3, But DOESN’T see Step 2 or Step 1 — what does GA do? It adds a count to Step 1 and Step 2 ANYWAY. This Horizontal Funnel method does not do this. So if you have a funnel with entrances into the middle of the funnel, numbers may be different. There are probably other good reasons why they could be different as well, but that is the most obvious one and definately needed to be pointed out. Until very recently I’d heard numerous tales of Steve Martin’s humorous responses to fan mail, but frustratingly had never seen such a letter; thankfully that situation was remedied the other week when I chanced upon the following note, apparently sent by Martin in the early-80s, post-Jerk (ahem), when he was at the top of his game. 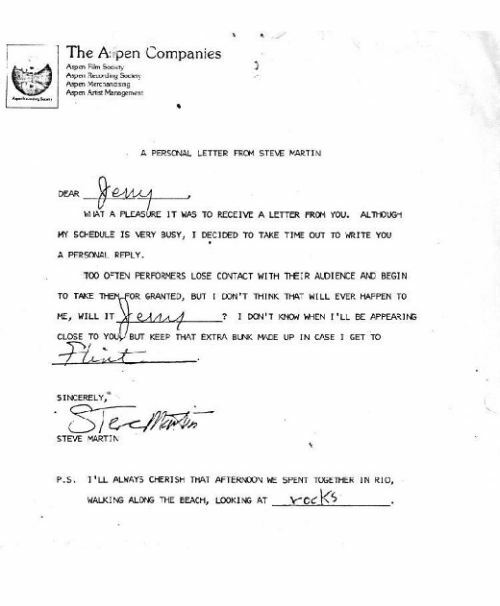 Written on his production company’s letterhead to a fan named Jerry, this personalised form letter – in particular the post-script – is further confirmation that almost everything Steve Martin produced during that era was incredibly funny. Last week the leftists on the Los Angeles City Council voted to boycott Arizona. Today, a representative from the Arizona Corporation Commission responded. Gary Pierce, one of the commissioners chosen in state-wide elections to the utility regulation panel, noted that Los Angeles gets about 25% of its power from Arizona producers. He sent a letter to Mayor Villaraigosa. I was dismayed to learn that the Los Angeles City Council voted to boycott Arizona and Arizona-based companies — a vote you strongly supported — to show opposition to SB 1070 (Support our Law Enforcement and Safe Neighborhoods Act). If an economic boycott is truly what you desire, I will be happy to encourage Arizona utilities to renegotiate your power agreements so Los Angeles no longer receives any power from Arizona-based generation. I am confident that Arizona’s utilities would be happy to take those electrons off your hands. If, however, you find that the City Council lacks the strength of its convictions to turn off the lights in Los Angeles and boycott Arizona power, please reconsider the wisdom of attempting to harm Arizona’s economy. People of goodwill can disagree over the merits of SB 1070. A state-wide economic boycott of Arizona is not a message sent in goodwill. Los Angeles to Boycott Arizona… Maybe It’s Time for Arizona to Cut Off Their Lights? General Motors has been running ads on all the major networks claiming the company repaid its $6.7 billion U.S. government loan "with interest five years ahead of the original schedule." General Motors Company CEO Ed Whitacre can be seen in the ad walking through an auto plant as he touts the company's progress. But lawmakers, and even the inspector general for the bailout fund GM borrowed from, point out that General Motors only repaid the bailout money by dipping into a separate pot of bailout money. They say the company did not actually use its own earnings to make the early payment and are questioning why executives are making such a big deal out of it. The workings of the bailout and what is actually being repaid and how are complex but simplified basically GM is repaying their "loan" with other money from the government, not from any actual earnings. The $6.7 billion is also just a fraction of the $52 billion General Motors received in government aid. Grassley said lawmakers are being told government losses on GM are expected to exceed $30 billion. The TARP inspector general, Neil Barofsky, bluntly told the Senate Finance Committee during a hearing last week that the repayment "is just other TARP money" and lawmakers should not "exaggerate" the feat. "It sounds like they're kind of like taking money out of one pocket and putting it in the other to do that," Sen. Tom Carper, D-Del., said at the hearing. General Motors admits that the company is repaying the loan with other government money, but says a year ago "nobody thought we'd be able to pay this back." The shelves in my office are overflowing with so many books that I’ve started hiding them other places around the house (the bathroom closest now has a complete set of the Harvard Classics). My wife can’t understand why I need to keep buying even more books (and she doesn’t even know about the bathroom library yet) but now I have an excuse to justify my bibliophilism: The more books I have the better our kid will do in school. By the way, if you talk to my wife, please don’t mention that whole “correlation doesn’t equal causation” thing to her. This may come as a surprise to some, but Bob Marley’s hit “Jamming” actually has nothing to do with fax machines.